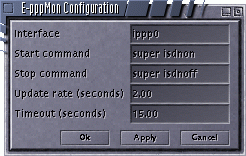 E-pppMon is an enlightenment epplet for monitoring a PPP connection. It allows you to start and stop the connection and displays the connection time and the transfer rate. Please note, the current version only supports Linux and ISDN.